Carole Medal, Gail Borden Public Library Executive Director, Named Illinois "Librarian of the Year"
Carole Medal, Executive Director of the Gail Borden Public library in Elgin Illinois, is the recipient of the 2013 Illinois Library Association Librarian of the Year Award. The award recognizes a librarian’s distinguished service and leadership in Illinois libraries. The award is sponsored by the Sikich. Carole Medal believes libraries should be a hub in their community. Under her direction, the Gail Borden Public Library is on the cutting edge, willing to embrace change, creative, and connected with their community through collaboration. Carole has encouraged her staff to look for new ways to serve their community which have resulted in increased attendance, circulations, library card registrations, and partnerships. One of her collaborated exhibits included an opportunity for students to hold live conversations with astronauts on the International Space Station. Through her partnership with the local school district, more than 8,000 students now possess library cards and all students participate in the library’s summer reading program. Under Carole’s direction, the Gail Borden Public Library has been recognized on local, state and national levels for both grants and awards. Carole has also received many personal awards for her work in libraries. Carole has been active in ILA, including having served as ILA President for 2009-10. 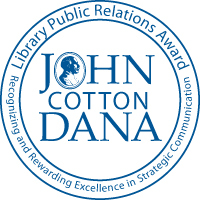 StoryTubes - the 2-minute or shorter "my favorite book" video project - has won the PLA Polaris Innovation in Technology John Iliff Award and that win couldn't have come at a better time. The $1,000 PLA award honorarium prize will go into the project. The American Library Association (ALA) recently announced that the Gail Borden Public Library District of Elgin, Ill. is the 2006 winner of the Marshall Cavendish Excellence in Library Programming Award for its project "GIANTS: African Dinosaurs, created by Project Exploration" exhibit.